Hearts of palm, called chonta in Spanish and palmito in Portuguese, can be found canned in supermarkets around the world. Not many people understand this unique and delicious vegetable though. Incredibly healthy, hearts of palm are rich in potassium, iron, zinc, phosphorus, vitamins B2, B6, and C, as well as high in fiber. Literally the heart or core of a palm tree, hearts of palm are harvested by cutting down a palm tree, stripping off the bark and fibrous interior layers, before finally reaching the soft whitish core. 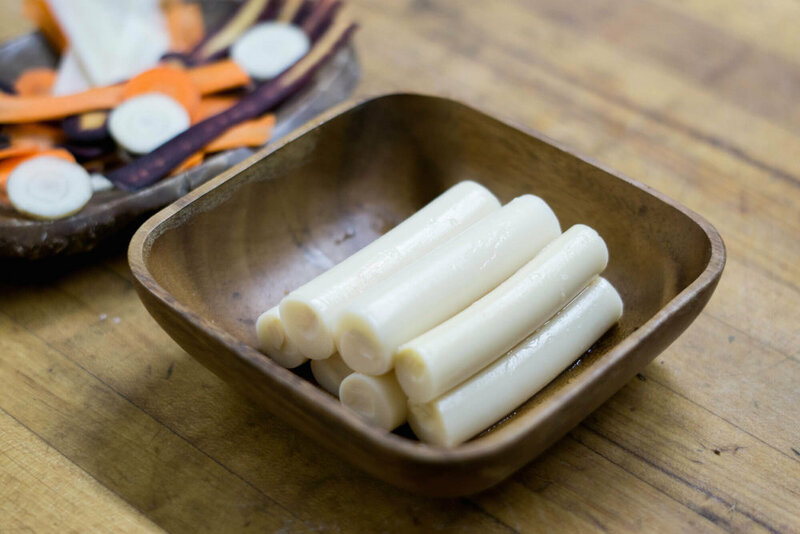 Similar in appearance to white asparagus and with a slightly artichoke flavor, hearts of palm are delicious raw in a salad or cooked in a variety of recipes. Many different palm trees contain edible hearts and as such, hearts of palm are not unique to Amazonian cooking. However, for most of the last century Amazon jungle palm trees, in particular Palmito Jucara, have supplied most of the world wide demand. Traditionally, hearts of palm were harvested from wild single-steamed palms. In order to reach the core, a palm tree would have to be cut down, killing the plant. For generations, Amazonian tribes sustainably harvested hearts of palm and even up until the 1960s, it seemed the jungle had an unlimited supply of palm trees to provide. With growing population numbers in the Amazon though and a desire for hearts of palm increasing around the world, the wild harvesting of single-steamed trees simply could not continue without driving the trees to extinction. A shift to farmed, multi-steamed palms began. With multi-steamed palms, hearts of palm could be extracted from a tree without killing it. One steam could be cut off the tree, leaving the tree alive, and allowing a new steam to grow back in its place. The most common multi-steamed palm trees grown in the Amazon today are the Acai Palm and Chontaduro, known as Peach Palm in English. Chontaduro palm trees can grow up to 40 steams on each tree, allowing for extensive harvesting. Acai Palms have the added benefit of producing acai fruit, a second source of income for harvesters. The key to sustainable hearts of palm is two fold. First, you must consider the palm tree it came from and look for companies that sell only multi-steamed palm varieties. Second, consider how sustainably the farmed multi-steamed palm trees are grown. Rather than slash and burn industrialized farms, support organizations that promote agroforestry farming where each plot of land holds a variety of native Amazonian crops, grown in harmony. Ignoring the ethical issues around hearts of palm while driving up demand by adding it to our own dinner tables beyond the Amazon can and will directly lead to deforestation. Support those companies and organizations doing the right thing. Slice the palm hearts into very thin strips. Slice additional vegetables (onion and tomato are the most common in the Peruvian Amazon) and combine with the palm hearts. Add salt, pepper, and lemon juice to the salad and toss to combine before serving.